NOS bottle blankets are used to help stabilize nitrous temperatures by keeping heat in the bottle when it's cold and out of the bottle when it's too hot. 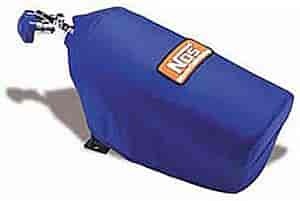 Manufactured using a durable, cleanable black or blue nylon outer shell with insulation, NOS nitrous bottle blankets will dress-up and cover your old and scratched bottles. 14165 is rated 3.5 out of 5 by 2. Rated 4 out of 5 by Fire me up from Functional Bought it for my race boat , the insulation is thinner than expected and I had my wife sew extra straps to hold it on. It's made of nylon. Rated 3 out of 5 by strokedsbc from Nos blanket It is a NOS blanket. It is not insulated. It is pretty much a washcloth with an NOS patch sewn on. It is probably not worth the asking price. If I had to purchase again, I would go for a cheaper alternative.